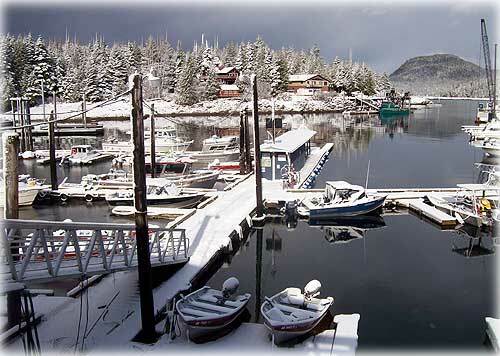 The first day of spring at Knudson Cove Marina. will close at midnight, March 31. PFD Director Deborah Richter encourages applicants to file online, "Applying online is fast and efficient. Applicants immediately receive a confirmation number ­ proof that the PFD Division has received their application." As of mid-day March 19, over 423,723 Alaskans had applied online ­ 3,127 more applicants than the total of all 2007 online applicants. Petersburg: ALASKA AIRLINES SUSPENDS PETERSBURG SERVICE MARCH 23-APRIL 21 DUE TO RUNWAY CLOSING - Alaska Airlines will not operate in or out of Petersburg from March 23 to April 21, 2009, due to the State of Alaska, Department of Transportation and Public Facilities (DOTPF) closure of the Petersburg runway to jet aircraft operations. The closure is necessary to replace several culverts that span the runway. While the Petersburg runway is closed, flights will spend additional ground time at the Wrangell airport to accommodate Petersburg customers and cargo traveling to Wrangell. Alaska: OFFICIALS CONDUCT TEST OF THE ALASKA TSUNAMI WARNING SYSTEM - A test of the Alaska Tsunami Warning System was conducted this morning by the National Oceanic and Atmospheric Administration's (NOAA) National Weather Service, and the Alaska Division of Homeland Security and Emergency Management, in cooperation with local emergency management offices and the Alaska Broadcasters Association. At approximately 9:45 a.m. Alaska Standard Time a live tsunami test code was distributed by the Alaska Emergency Alert System. People listening to radio or television broadcasts should have heard the test if the system is working properly. Through a proclamation signed by Governor Palin, March 22 through March 28, 2009 has been declared Tsunami Awareness Week. The week coincides with the anniversary of the Great Alaskan Earthquake...a devastating 9.2 magnitude earthquake that triggered deadly tsunamis in Alaska 45 years ago on Good Friday. The focal point for this awareness week is the test of the Alaska Tsunami Warning System. Alaska: Alaska Delegation Asks For Meeting With Obama To Discuss Arctic Management - The Alaska Congressional Delegation on Tuesday asked for a meeting with President Barack Obama to discuss Alaska's management of the Arctic. In a letter to Obama, the delegation urged the President not to take any "rash actions" regarding Arctic policy, saying that such a move could harm the nation's economic recovery as well as efforts to increase the nation's energy independence. "The Alaska delegation has taken the lead in protecting the Arctic and promoting conservation efforts using the best available science," according to the letter. "Far too often, though, talk of implementing 'science-based precautionary management' in the Arctic is in reality simply code for ignoring the scientific evidence, shortchanging the process and trying to stop all commercial activity in the region." Pointing to oil and gas development and climate change in the Arctic, nearly 70 House Democrats have signed a letter to Obama urging him to implement 'science-based precautionary management' in the region. The lawmakers identified three areas of concern ­ the Beaufort and Chukchi seas, the Arctic National Wildlife Refuge and the National Petroleum Reserve-Alaska. They have called for taking ANWR production permanently off the table and suspending all new oil and gas exploration and development, both onshore and offshore. Fish Factor: Salmon harvest could be the 11th largest since statehood By LAINE WELCH - A bumper run of pinks could provide a 20 percent boost to Alaska's total salmon catch this year to 175 million fish. If the forecast holds true, Alaska's salmon harvest this year will be the 11th largest since statehood. State fishery managers have released the 2009 salmon run forecasts and catch projections for all Alaska regions. Here's a breakdown by species: for Chinook salmon, the total catch is pegged at 249,000, a decrease of 85,000 fish from last year. The statewide sockeye catch is projected at 38 million, a drop of one million reds from last season. The preseason projection for coho salmon call for a slight increase to 4.6 million silvers; likewise, chums should see a slight bump to 18.5 million fish. For those hard to predict humpies, state managers estimate the catch will jump to 113 million pink salmon, a 34% increase from last year. The state report also gives a great recap of the 2008 salmon season by region. Some interesting highlights: The salmon catch at Southeast Alaska and Yakutat regions totaled 28 million fish, with a dockside value of $117 million. Landings were made by 1,853 permit holders, a slight decrease. At Copper River, the 2008 sockeye salmon catch of 321,000 was the lowest in 30 years. The near record 42.4 million pink salmon catch at Prince William Sound was made up of 97% hatchery raised fish. Lower Cook Inlet had the lowest salmon catch in a decade, but increased prices pushed up the value to $3.96 million. That ranks as the highest value since 1988, and the fourth highest since statehood. Salmon catches in the Kuskokwim region by 462 permit holders totaled 494,108 fish, an increase of 50,000. A total of 496 permits fished salmon on the Yukon River last year. The average fishing income for the Upper Yukon was $2,633; for the Lower Yukon, income averaged $1,479. Norton Sound enjoyed the third largest coho salmon harvest on record and a resurgence of pink salmon fishing. The combined harvest of all salmon species was the best in ten years. The 2008 fishery was valued at $760,362, the highest since 1994. The average fishing income value for Kotzebue fishermen was $8,026. At Kodiak, only 277 out of 608 permit holders landed salmon last year. The value of the Kodiak catch increased by $3.5 million, to $27.87 million. Fifty-four salmon permit holders fished at Chignik, where the dockside value of $7.3 million equates to about $234,000 in fishing income per permit holder.